Tradeindia.com brings to you dedicated packages for the promotion of your shows/events using quality promotional tools. These popular tools will help in taking your show/event information to thousands of targeted companies dealing in products and services matching the product profile of your show/event. These tried and tested result oriented tools will help you get desired audience for your shows in India and around the world. Rotational Banner Advertisement on Country Page. Facebook Advertisement with Event related keywords. Sponsored Keywords Banners on Tradeindia (3 Keywords). Video Promotions on Youtube Worldwide. Display Banners on Related Websites. 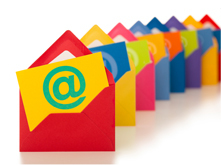 Promote your trade shows right into the inbox of your target customers. Connect with buyers, suppliers, exhibitors & visitors directly. Place your banner on Trade Shows homepage, your target category and country pages. Generate more traffic to your Trade Shows and Events.